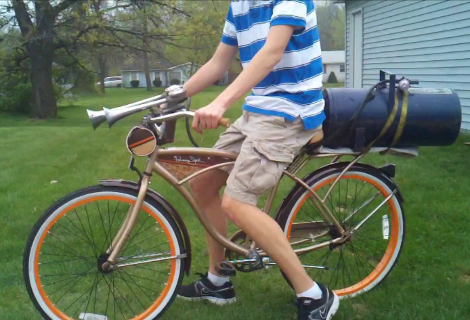 [TheChadster] was kind enough to explain that the air horn he attached to his bicycle is not actually as loud as a train horn. This one can only be heard from a half a mile away. But we’re sure the ringing in your ears will seem the same… the video after the break proves this thing is way too loud. You don’t need much for this, just a pair of air horns and a source of compressed air. [Chad] has a ten gallon air tank strapped onto the luggage rack on the back. We’d bet he can lay on the horn for quite a while before depleting that reservoir. The hardest part of the build (other than sourcing the parts without breaking the bank) is going to be attaching everything to the bike. This is why he recommends using a cruiser bicycle because they often already have a rack on the back. For the horn holder [Chad] found a leather cup holder worked almost perfectly. We think he needs to turn this around and add some compressed combustibles for a fiery and noisy flame boost. Um, that doesn’t sound quite like a train horn. Truck horn, maybe. Still absolutely worth it, though! I recommend a Youtube search for “truck train horns”, where some users take *actual* train horns, mount them to their truck, and proceed to terrorize pedestrians. Oh it’s a train horn alright. You are probably just used to hearing it with the doppler effect and that is why is doesn’t sound right. Not to be that guy, but I imagine at some volume drivers will be startled, increasing your chances of becoming roadkill. Nice hack, but wear a friggin’ helmet! I have had one of these on my mountain bike for a few years now. It’s awexome and loud as hell. Get a front brake. Better than a helmet. You’ll actually use it a lot, more weight to stop. Take it to the next level. Slim propane tank, air shock repressurization on a shock frame bike. 50 yrs ago, I had an air horn on my bike with a small tank I would fill to 150 psi. It was good for about 3 short blasts. Cars and trucks would hit their brakes when they heard it, and dogs would never chase me more than once. Use CO2 12grams to power the horn. haha. scrapper bikes. …now I feel sad for my kids. I used to have a genuine train horn on my little old Ford Ranger pickup truck, salvaged from an actual old diesel locomotive. Scared the **** out of more than a few people who cut me off in traffic..